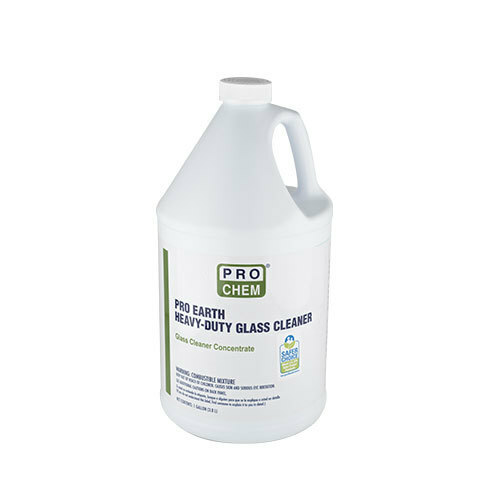 Pro Earth Heavy-Duty Glass Cleaner | Pro Chem, Inc. PRO EARTH HEAVY DUTY GLASS CLEANER is one of the most effective biodegradable glass cleaners available. It quickly removes dirt, grease, bug stains, grime and smoke film, leaving glass and reflective surfaces clean and sparkling. It will not streak, smear or smudge. Dilute 1 part product with up to 20 parts water. Spray diluted glass cleaner on surface and wipe dry with a clean cloth. Will not scratch surface. POTABLE WATER RINSE IS REQUIRED WHEN USED IN FEDERALLY INSPECTED MEAT AND POULTRY PLANTS.